With iPhone season upon us, you may find yourself with a phone you plan to give up soon. Which will lead to the question of, “What do I do with the old one?” Well, before we go any further, whatever you do don’t throw out it out in the trash! Most gadgets have harmful elements in them that aren’t good for the environment, so don’t go that route. So what do you do with them then? Yes you can go to eBay and sell them, but speaking as a former Power Seller, processing hundreds of orders a month, I know what a nightmare that can be with fraud, non-paying bidders and so on. You could give them away to relatives or friends, or you can try to eek at least a few dollars out of them. Luckily there are several options for you if you decide to peruse this route these days. Some of them are as close as just driving down the street, while others, who aren’t as close, try to make it as easy as possible. More than likely you shop on Amazon, so why not sell some of your items back to the company? Amazon trade-in will take electronics as well as video games, books, music and DVDs/Blu-rays. Payment is made in the form of Amazon gift cards that are automatically credited to your account once the items have been accepted. 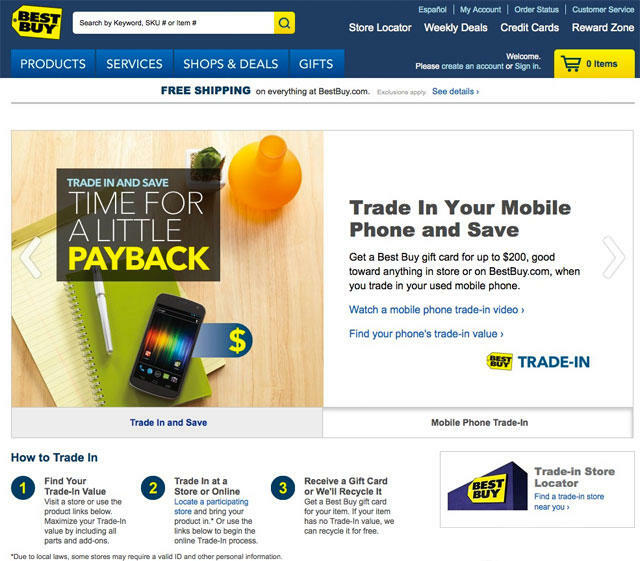 Best Buy gives you the option of trading in items either by going into the stores or online, but be warned in-store trades are fairly limited. If you choose to visit a retail location you will need a receipt from Best Buy and it is restricted to iPods, Apple computers, PC laptops and mobile phones. 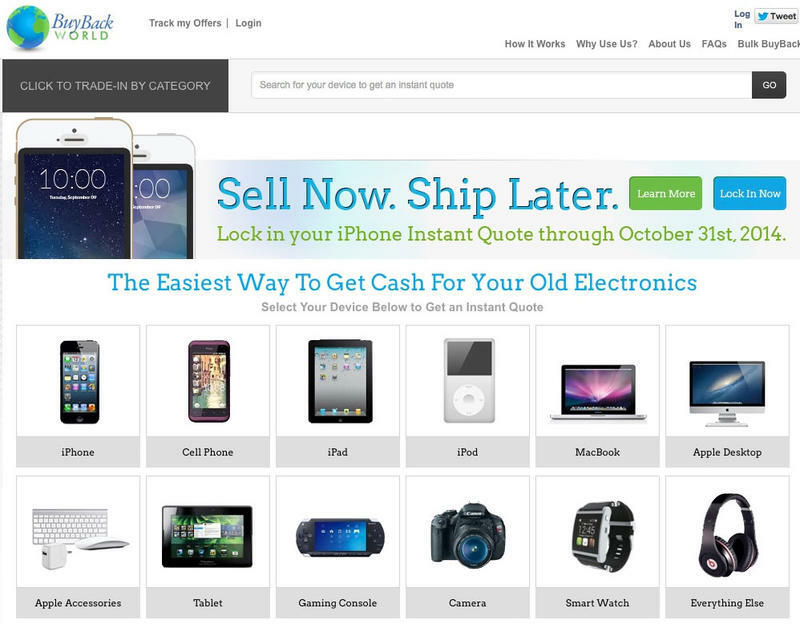 The online trade-ins are far more expansive in the range of products they will accept. Unlike the in-store trade-ins, these products can have been purchased from anywhere. Payments are made in the form of Best Buy gift cards. Payments are made in the form of checks or PayPal. 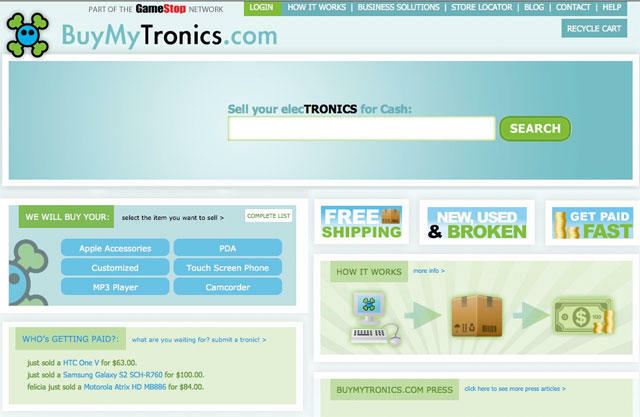 BuyMyTronics is associated with GameStop and takes a ton of new products as well as old ones such as Palm PDAs, with support for additional item types coming soon. If the company is unable to give you a trade-in value it’ll take your item for free and recycle it responsibly. Payment is made by check or PayPal. Gazelle is one of the most well-known trade-in companies and has built a good reputation for itself in the world of technology. 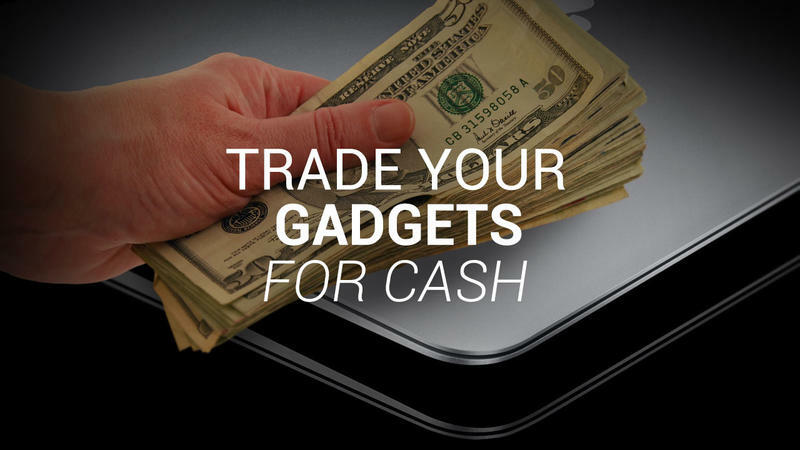 The transaction is completely handled online and you simply tell them what product you have, answer a few questions about it, and they will give you a quote of how much they will pay you. If you accept it, you have 30 days to get it to them and, depending on the item they will even send you a box for it with a pre-paid label. 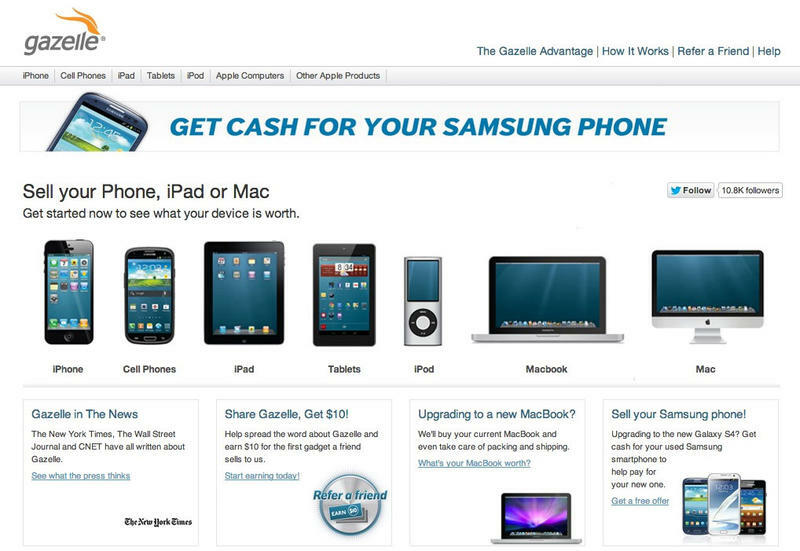 Gazelle offers payment by check, PayPal or Amazon Gift Card. 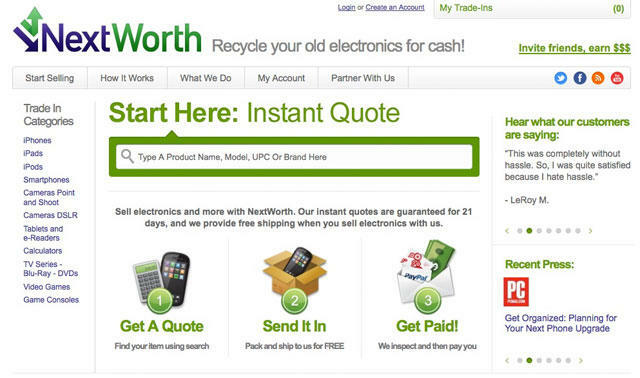 Unlike the majority of trade-in options, NextWorth is not an online only operation and has partnered with the Target chain to let you do in-store trade-ins. The offers may be slightly lowly however if you decide to go the Target route. Payments from NextWorth are made via check, PayPal or Target gift card. 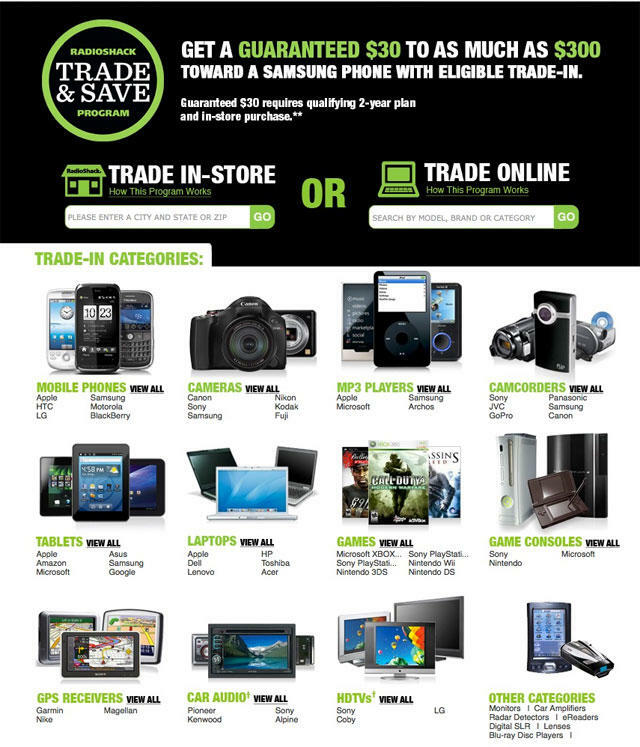 RadioShack has merged the online and offline recycling systems allowing you to configure your trade-in online and then taking the item to one of the stores should you choose. Payment is made in the form of RadioShack gift cards. Another option for sending out your stuff after finding a price online for it. While it works pretty much the same way Gazelle does, and the prices seem pretty close to one another, it never hurts to have another opinion to check. The site is very clear that its number one concern is making sure your gadgets go anywhere but a landfill and will do whatever it takes to make sure of that. Payment is made in the form of a check. That’s when you give it a family member. If the item isn’t working, you can also check your local phone book for places to recycle items. Just because you’ve got something shinier and newer than your old one doesn’t mean you give up treating your old items responsibly. Make sure they end up where they belong! 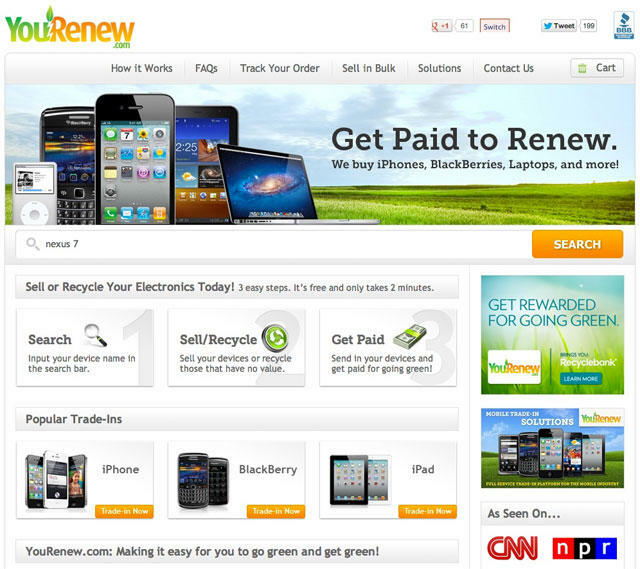 1-800-Recylcing.com – Not only will this site help you find somewhere to recycle your tech, but also numerous other types of items. eStweards – This non-profit organization will help you locate places to recycle your goods. GreenGadgets.org – Run by the Consumer Electronics Association, this site will help you find recycling solutions near you.